Strawberries! Everyone gets excited about strawberries! They’re the first sign of spring, The Beatles love them, cartoon has-beens love them… everyone loves them! Everyone except me. I don’t love strawberries. I never did much — I prefer super sweet fruit like pineapple and watermelon rather than tart fruit, so I never ate plain strawberries. And as a kid, I basically would only eat chocolate desserts, nothing else. But now, I have an appreciation for strawberries. I enjoy many strawberry desserts and have occasionally been known to eat a plain strawberry or two. But I still don’t love them. You know why? Because I don’t like liars or fakers. And I found out that strawberries aren’t real berries. They’ve been posing all this time. Imposters! Well, other than my weirdness about berry fakers, I really don’t have much to say about strawberries. We’re all pretty familiar with them. They taste good, they’re good in salads, they’re good in desserts, they’re good with chocolate, blah blah blah. I can sit here and think up a few different strawberry desserts in my head right now, but it’s a little more a difficult to think up a meal. I’ll have to do some research and plotting, and hopefully I’ll get a few recipes posted before strawberry season ends. Oh, and don’t forget! 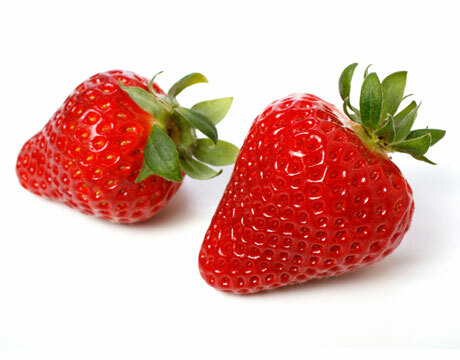 The strawberry is one of the dirty dozen, so buy organic!